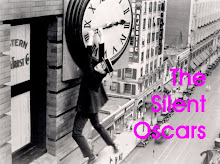 For best supporting actor of 1929-30, I had my pick from several standout performances, among others, Louis Wolheim as a grizzled soldier in All Quiet On The Western Front, Douglas Fairbanks, Jr., as a cad with a conscience in Our Modern Maidens and Chico Marx as a particularly dim-witted con man in the comedy classic, The Cocoanuts. 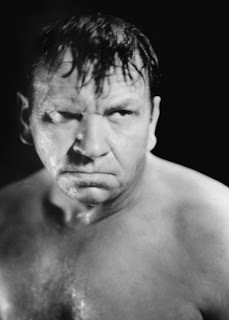 Topping them all, though, was Wallace Beery as the unforgettable "Machine Gun" Butch Schmidt in the prison drama, The Big House, which was not just the best performance of the year, but the best Beery gave in a career that included work in classic movies such as Grand Hotel, Dinner at Eight as well as an Oscar win for The Champ. Yet as great as Beery was, he wasn't the studio's first choice for the role and it was only a sloppily-eaten plate of spaghetti that landed him the part at all. 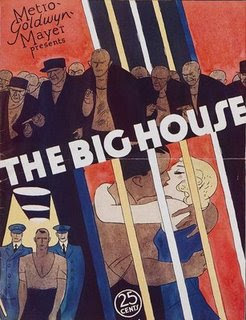 The Big House is the story of three very different convicts thrown together by a deeply-flawed and indifferent correctional system: the young rich pretty boy, Kent Marlowe, played effectively by Robert Montgomery, recently sentenced to prison for vehicular homicide after a drunk driving spree; Wallace Beery as Butch, who is doing a life sentence for a trio of murders; and Chester Morris as John Morgan, a small-time forger, natural leader and the only man who can control Butch's homicidal tendencies. In re- searching the back- ground for her story, screen- writer Frances Marion toured prison facilities and inter- viewed both prisoners and prison personnel, and while the screenplay exhibits her typical light touch, it is a scathing portrait of the American penal system. She won an Oscar for her efforts, becoming the first woman in a non-acting category to win an Academy Award. Silent film star Lon Chaney was originally cast in the role of Butch but fell ill before shooting began and died later that summer. As his replacement, Marion persuaded MGM to cast Beery after seeing him eat spaghetti in the studio's cafeteria, saying later that something about the way he ate reminded her of the convicts she had interviewed at San Quentin. Beery was a veteran of 183 silent movies, including The Lost World, Robin Hood, Beggars of Life and Buster Keaton's first feature length movie, Three Ages, but Paramount had dropped his contract as part of a wholesale purge at the end of the Silent Era and he hadn't worked in a film in more than a year. Marion's choice turns out to have been inspired. Although the story centers on Chester Morris, who must find personal redemption without betraying his fellow inmates, it's Beery who has the pivotal role. He must be menacing enough to present a very real danger while being charming enough to give the audience a rooting interest in his fate. Beery essays the part brilliantly, turning Butch into a hulking, conniving, yet likable sociopath who often seems perplexed at his own brutality. "I shouldn't have slipped her that ant poison," Butch laments while reminiscing about his late love Sadie, "I should have just batted her in the jaw." Beery is solid in his first few scenes, particularly when Montgomery's Marlowe gets off on the wrong foot by complaining to a prison guard that Butch has stolen his cigarettes, then takes command of the movie in a sequence that has been imitated and parodied many times since. At dinner in the prison mess hall, he explodes "I can't eat that stuff!" throws his plate, bangs his cup and starts a riot. That a scene copied by everyone from James Cagney to Leslie Nielsen still holds its power nearly eighty later is a testament to Beery's ability as an actor. The scene is typical of the movie as a whole, capturing the boredom and desperation of prison life, the casual cruelty, the lack of hope and purpose, yet so well-told and acted, that despite having a point to make, it never becomes a chore to watch. The Big House is quite subversive, I think, as a study of the society that created such a prison system. 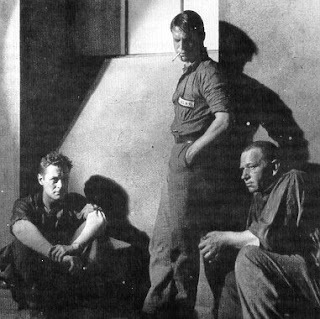 The prison warden (Lewis Stone) is passive and ineffectual, rich kid Marlowe turns out to be a cowardly weasel, while two hardened criminals are strong, likeable and sympathetic. 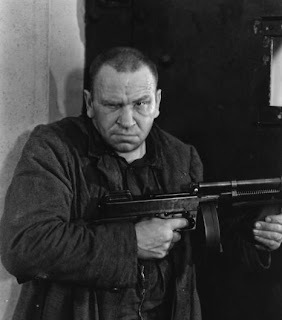 The movie is also an indictment of a system that warehouses men in cells not much wider than Butch's shoulders without regard to the effect a sociopath such as Butch will have on a weak naif such as Marlowe, turning the later into a hardened criminal, a victim or both. As Butch tells Marlowe on first meeting, "I'll learn you a lot of things before we're through with you in here." You just have to wonder whether they are the sorts of things we really want anyone to know. During his years in Hollywood, Beery developed a reputation of being difficult to work with. Child actor Jackie Cooper (The Champ) called him "the most sadistic person I have ever known," and Jean Harlow, his co-star in Dinner at Eight, detested him. Louise Brooks, on the other hand, who could be scathing in her dismissal of those she didn't like, adored Beery, saying that while he was "the meanest bear alive on the set," he was "a honey bear" off it. Maybe he was all of those things. Who knows. In any event, after earning an Oscar nomination for The Big House, Beery co-starred with Marie Dressler in her Oscar-winning vehicle Min and Bill, won an Oscar of his own playing a broken-down boxer in The Champ, played key roles in Grand Hotel and Dinner at Eight, and was unforgettable as Long John Silver in 1934's Treasure Island. He worked steadily right up until his death of a heart attack in 1949 at the age of sixty-four. "When my time is up," Machine Gun Butch boasts in The Big House, "I'll still be standing on my feet." The same could have been said of Beery himself. I freaking love the way you pull out the perfect lines of dialogue to illustrate your points; e.g. re Butch regretting the fork in the road where he took the ant poison path rather than the tried 'n true batting in the jaw path. The spaghetti story is amazing. Silent film star Lon Chaney was originally cast in the role of Butch but fell ill before shooting began and died later that summer. Although many people confuse us, my Uncle Wally was a more gifted actor, and a great inspiration to me. Thank you for noting his work. My father was always inspiring, but I think I might have branched out and tried something different -- no man wants to become his father when he's young. But the inspiration provided to me by my uncle was one of the most important influences in a young boy's formative years. That, and my work with Douglas Fairbanks during the making of The Mask of Zorro. Why, even my father remarked that Douglas Fairbanks reaffirmed, for my pops, the joys of acting. Hell, of being alive. So again, I thank you for this forum, and for the recognition of Uncle Wally's work. PS He was tyrannical on the set, but anything but a tyrant in life. He was a good, solid man. And I loved him. Hmm, spaghetti ... I think I know what we're having for dinner tomorrow night. Ah, Douglas. Still bitter that Lon was a great actor and you were just a muscular pretty boy?